Smartwatches have been around for a few years now, so much so that the novelty has worn off and the more practical aspects of a smartwatch is often taken into consideration before making a purchase decision. Mobvoi, a Google-backed entity, has decided to forge ahead with its all-new TicWatch Pro, where it is being touted to be a premium wearable smartwatch that carries an equally premium price tag of $249.99 apiece. 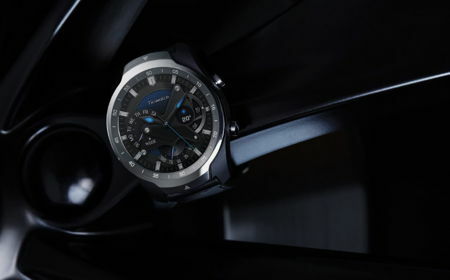 Sporting a build quality that surpasses that of cheap plastic and rubber, the TicWatch Pro will sport a stainless steel (SUS) bezel as well as rear cover, in addition to a glass fiber-reinforced nylon case, all of it accompanied by a hybrid silicone/Italian leather strap. There are also a couple of hardware buttons that can be pressed in order to summon the Google Assistant, to open up the app list, to activate Google Pay, as well as other actions through a series of different taps or long-presses. As for the lower button, it can also be used customized in order to launch a pre-determined favorite or frequently used app. What makes the TicWatch Pro stand out from other smartwatches would be its Layered Display, where it is made up of a transparent FSTN (Film compensated Super Twisted Nematic) LCD display that will remain on top of the main OLED panel. This enables selected information such as time, date, step count, and heart rate to be seen all the time without having a negative impact on battery life. The Essential Mode will rely on only the low-power secondary display, and Mobvoi claims that this will help it last anywhere from 5 to 30 days, which is a rather huge spread. I would lean more towards 5 days, as an entire month would be a real stretch of the imagination. In Smart Mode, users should be able to obtain approximately 2 days of battery life before a trip to the power outlet is required.